Swiss Ronda Caliber 515.24H quartz 3-hand with date, GMT. "When I first saw this timepiece, I was really flashed by its beauty. It has exceeded my expectations. Everything is perfect, no matter from which angle I look at it. I love this watch." Rebels often have to be two places at once. Not currently possible in a physical sense, you can track time in two places with the Rebel-GMT. 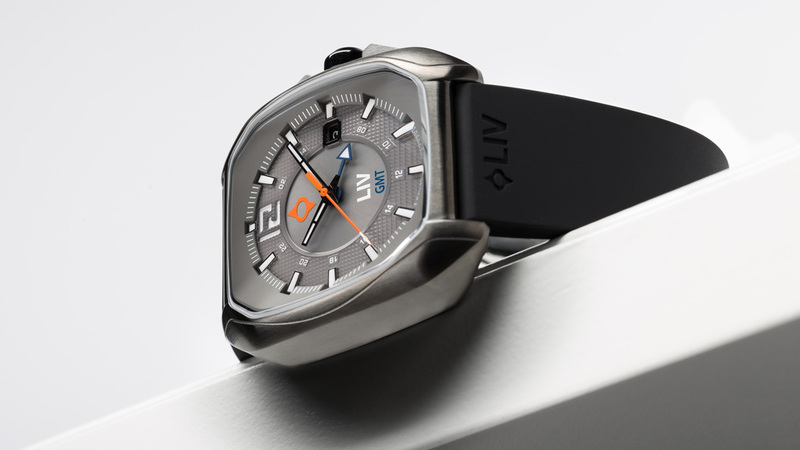 This remarkable timepiece boasts the Swiss Ronda Caliber 515.H24 GMT quartz movement. Set one time to your current location and track another with the GMT capability. The Rebel-GMT shares the same attention-grabbing case design as the rest of the Rebel series; hand finished to a flawless sheen. All done in the best 316L stainless steel for uncompromising strength. The case drapes over your wrist and slides easily under the cuff, though you may prefer to roll up your sleeves rather than hide this beauty. High-grade anti-reflective sapphire crystals provide superb protection and visibility of the 3D multi-layered dial. Add your touch choosing from a wide range of strap and bracelet options. You may prefer to rock the NATO look. Supple double injected silicone may fit your lifestyle better, especially around the water. Or, the timeless elegance of hand-crafted leather may be a perfect choice. Dare to LIV your life your way. Make a statement with this rebellious watch design and grab a Rebel-GMT. It will be with you through a lifetime of adventures. Numbered limited editions of 1500 in this color. 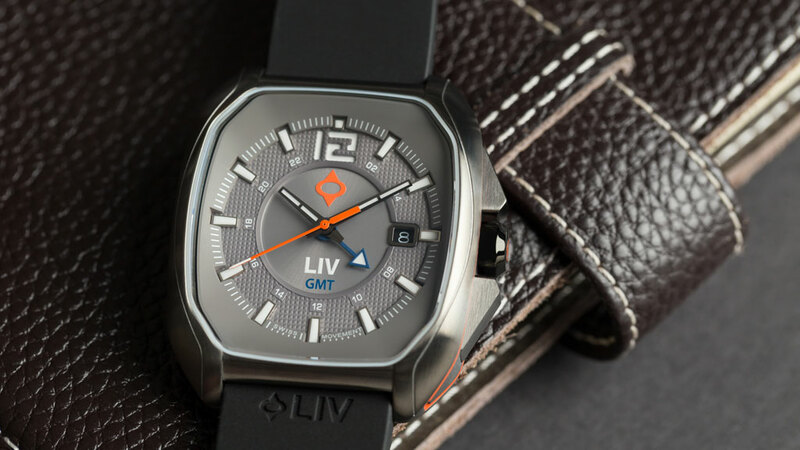 This watch has lived up to the LIV standard once again. The design is superb, the quality is impeccable and the style is simple but sharp. The blue dial with the signature orange contrast gives a certain pop to the watch. 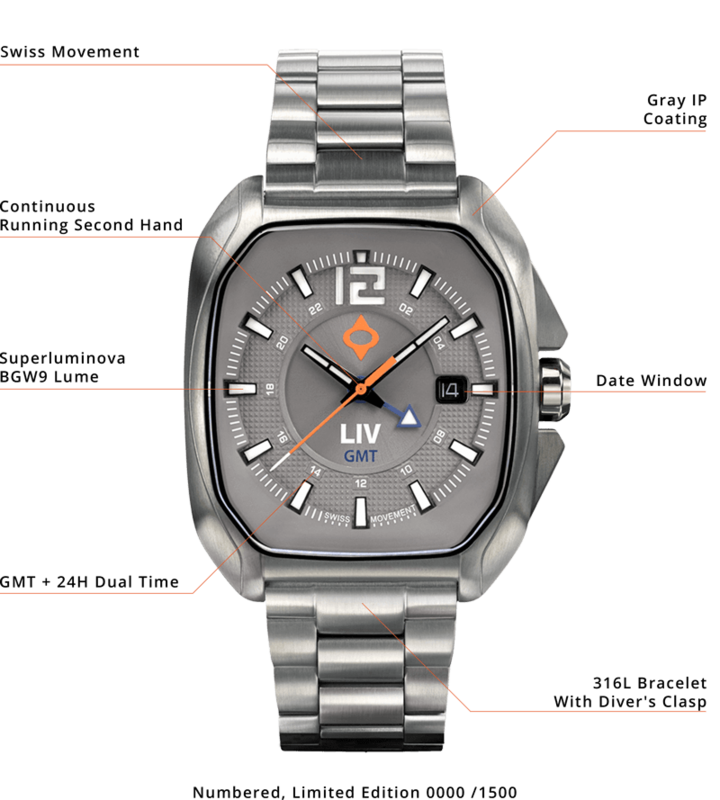 My LIV Rebel-GMT Helped me get better! The joy i felt when i received my watch, after a long wait, helped me with a speedy recovery. I received it lying in the hospital bed, from my girlfriend, who brought it from home where it was delivered. As I unboxed my new watch, I could literally feel myself getting better - this Rebel-GMT doesn’t just tell the time! Elegant, but with the bold touch of the orange and cobalt contrast that catches the eye... love it!!! Best Watches I have Ever Owned! I bought the Rebel GMT and GX Alarm and love them! Hardest decision is which one to wear. Everyone asks me where did you get your watch. Truly the best watches I have ever owned and I plan on buying more. Love the style, the colors, the fit and the cool packaging!!! I was looking for a unique Swiss made automatic watch that wouldn’t cost an arm and a leg. So far this watch exceeds my expectations with style and comfort. This was my first LIV but not my last !! Excellent watch with good quality & design. Beautiful, l love it. Now I am wearing it on my hand everyday. But I will be more prefect if the watch have night light. Besides, it is difficult to pull out the crown to adjust date & time. Need to improve. Finally, it is better to add one more different style watch belt in the package for replacement, that will be more prefect.